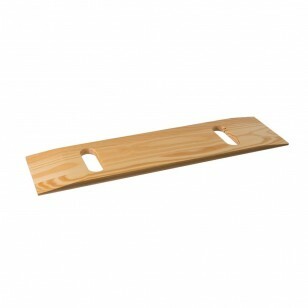 The DMI Deluxe Wood Transfer Board With Two Cut-Outs helps transfer patients from a wheelchair, bed, chair, or commode. Sealed and coated for protection and friction-free transfer and constructed of solid 3/4 in. southern yellow pine, this transfer board has a weight capacity of up to 440 lbs. 8 x 30 in.